The ECG in the Figure-1 was obtained from a previously healthy 19-year old man, presumably as part of a vigorous pre-exercise evaluation. No symptoms. How would you interpret this­­ tracing? In view of this presentation — What clinical entities should be considered in your differential diagnosis? How might you proceed in your evaluation? Figure-1: 12-lead ECG and long lead II rhythm strip obtained from an asymptomatic, young adult man as part of a pre-exercise evaluation. Can you explain the unusual findings in this otherwise healthy 19-year old? NOTE — Enlarge by clicking on Figures — Right-Click to open in a separate window. Interpretation: This ECG is markedly abnormal for a 19-year old man. The long lead II rhythm strip at the bottom shows a phasic arrhythmia, with upright P waves with a fixed PR interval preceding each QRS complex. This is most likely marked sinus arrhythmia — though it is hard to rule out the possibility that the slight reduction in P wave amplitude that seems to occur with slower rates might be due to a wandering atrial pacemaker. In either case — the rhythm is benign in a 19-year old man. 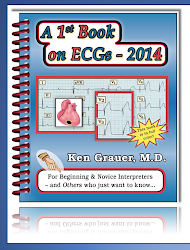 It is the remainder of the ECG that is of most interest. All intervals (PR, QRS and QT) appear to be normal. 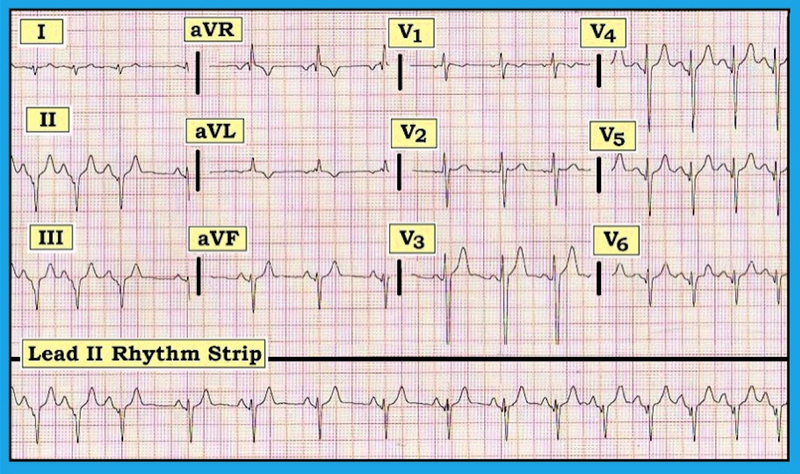 The mean QRS axis is indeterminate (predominantly negative in both leads I and aVF). There is no chamber enlargement. 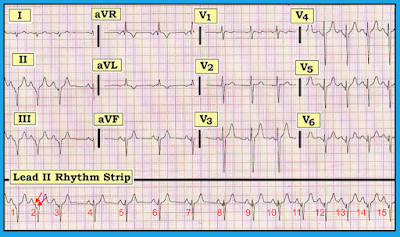 What IS distinctly unusual — is inferior negativity of the QRS, and an almost reverse R wave progression in the chest leads with small q waves in leads V4,V5,V6. There is T wave inversion in lead aVL, with T waves otherwise upright (albeit a bit peaked). BOTTOM LINE: This is not a “normal” ECG for an otherwise healthy 19-year old! The finding of a clearly abnormal 12-lead ECG for this young adult should raise a number of considerations (ie, previously undetected congenital heart disease; some type of cardiomyopathy; a prior episode of myocarditis that spontaneously resolved; etc.). An Echocardiogram was obtained, looking for underlying structural heart disease — but, the Echo was essentially unremarkable. 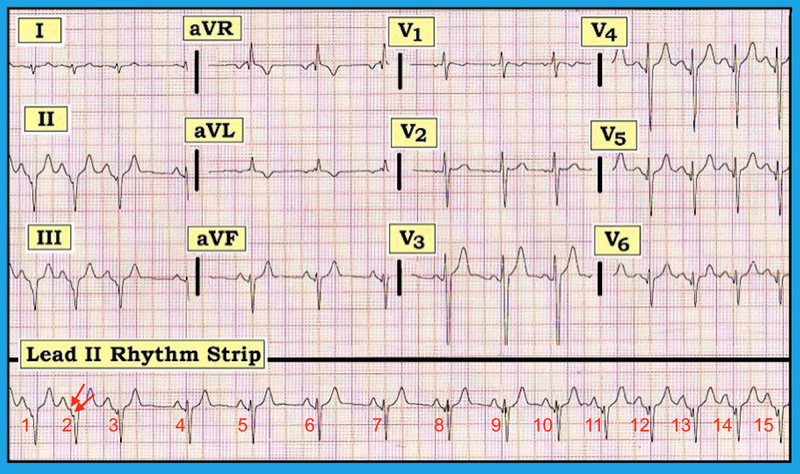 HINT: Look carefully at the terminal part of the PR interval in leads II and III. Is the terminal portion of the PR segment flat? COMMENT: The terminal portion of the PR segment in leads II and III slopes downward. Consultation with EP Cardiology confirmed suspicion that this ECG represents a Pseudo-Infarction Pattern in a patient with WPW. 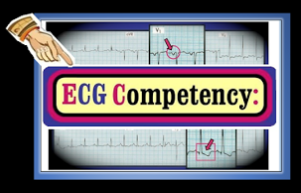 There are pros and cons to pre-participation ECG evaluation of otherwise healthy young adult athletes. The obvious goal of such evaluation is to detect occult cardiac conditions that might prove hazardous if unrestricted physical exertion is allowed. 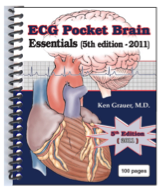 Among the problems with routinely obtaining pre-participation ECGs are: i) cost; ii) poor sensitivity of such screening (ie, a “normal ECG” may reduce risk, but in no way rules out all risk); and iii) potential for false positive results (ie, many unusual ECG patterns of no consequence may be seen in athletic individuals). That said — the degree of abnormality for the ECG shown in Figure 1 is so atypical for an otherwise healthy 19-year old, that search for the cause is clearly indicated. NOTE: I fully acknowledge not considering WPW when I first saw this tracing. Delta waves as we typically think of them — are just not seen. However, the list of potential causes of this unusual ECG picture dramatically decreased once a high quality Echocardiogram failed to suggest any form of underlying structural heart disease. 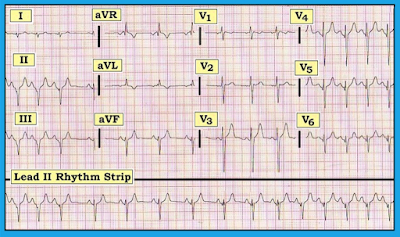 The Lesson-to-be-Learned — is that depending on the relative amount of preexcitation and the location of the accessory pathway — the appearance of WPW on ECG may be varied and subtle. The inferior pseudo-infarction pattern seen here is due to negative delta waves in leads II and III. Delta waves are otherwise not readily recognizable on this tracing. P.S. — Please LOOK AGAIN at the long Lead II Rhythm Strip! Excellent comments and questions by Nguyen Chi Tinh and Pham Le Tra (both from Vietnam) on the internet EKG Club inspired me to take another closer look at the long lead II rhythm strip that appeared at the bottom of Figure-1 (See Figure-2 below). 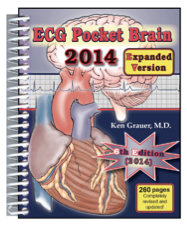 Question: How do you make a diagnosis of Wandering Atrial Pacemaker? Is that what we see in the long lead II rhythm strip shown here? In addition to subtle change in P wave morphology — Is anything else changing as one moves across this long lead II rhythm strip? (HINT: Look at the RED arrows in Figure-2 — and compare what you see with the P-QRST complex for beats #5 and 6). Figure-2: Taking another look at the long lead II rhythm strip that appeared at the bottom of Figure-1. Why is P wave morphology changing as one moves across this long lead II rhythm strip? Is anything else changing? Answers: Occasionally — the site of the atrial pacemaker may shift (wander) away from its usual site of origin in the SA (Sino-Atrial) Node. In most cases — Wandering Atrial Pacemaker is a benign normal variant that occurs in patients without underlying heart disease. It may result from variations in vagal tone (that slow SA nodal discharge and allow other atrial sites to temporarily emerge) — or there may be no obvious cause. To make the diagnosis — there should be at least 3 different P wave morphologies (representing shift to at least 3 different sites in the atria) — with gradual change over several beats (not abruptly! ) from one P wave morphology to the next. As you might imagine — this requires a fairly long period of monitoring! 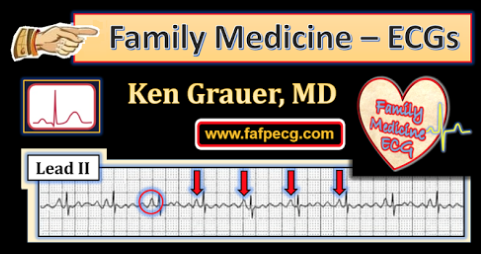 — which is perhaps the main reason we so often fail to recognize wandering pacemaker when it is present (most rhythm strips are no more than a limited number of seconds long …). Given the usual benign consequence of wandering atrial pacemaker — it is generally of no clinical significance that we fail to recognize it in asymptomatic and otherwise healthy individuals. Therefore, even IF the change in P wave morphology that we see in the long lead II rhythm in Figure-2 was due to shift from one atrial pacemaker to another — we technically could not diagnose a “wandering pacemaker” — because we do not see 3 different P wave morphologies. That is not what is happening in the long lead II rhythm strip! Instead — the 2 RED arrows in Figure-2 represent subtle-but-real downsloping of the negative delta wave that is intermittently present to varying degrees in lead II! Beats #4,5 and 6 in lead II appear to be conducting normally. Beginning with beats #7 and 8, a small and narrow q wave develops. Over the course of the next several beats, this q wave deepens and widens — eventually developing subtle downsloping toward the end of the P wave for the last few beats in the tracing. The effect looks similar to the appearance of the P-QRS juncture highlighted by the RED arrows at the beginning of the tracing. While easy to overlook these subtle changes (I missed them initially! ) — they are unmistakable in this 19-year old diagnosed by EP to have WPW when you compare normal conduction (beats #4,5,6) with P-QRS appearance at the beginning and at the end of this tracing. Thus, after the first 3 beats, that are conducted over the AP (Accessory Pathway) — we are seeing several normally conducted beats (beats #4,5,6) — and then progressive shortening of the PR interval with corresponding widening of the QRS complex as a delta wave again develops after the middle of this long lead II rhythm strip. This cyclic pattern, with gradual change in the relative amount of preexcitation that we see here in this patient with newly diagnosed WPW is known as the Concertina Effect. PEARL (Beyond-the-Core) — One way to help distinguish the Concertina Effect in a patient with WPW from late-cycle (ie, end-diastolic) PVCs — is that with the Concertina Effect, the PJ interval (ie, distance from the beginning of the P wave to the end of the QRS complex) remains constant. It won't with late-cycle PVCs if there is some change in the coupling interval. The “good news” — is that on those occasions when you do see a definite Concertina Effect (the Concertina Effect is not a very common phenomenon in patients with WPW) — it is a surprisingly good indicator of a relatively long AP refractory period. As a result, excessively fast rates with AP-associated SVT rhythms are much less likely in such patients (since a longer refractory period limits the number of impulses that can be transmitted over the AP). 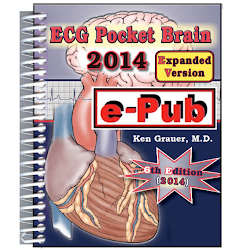 This portends a relatively lower risk of sudden death during a WPW-related tachyarrhythmia. Thus, recognition of the Concertina Effect in this 19-year old with newly diagnosed WPW at least provides positive prognostic information (ie, if ablation of the AP is not initially done — at least the relative risk of a potentially lethal WPW-associated tachyarrhythmia is lower). 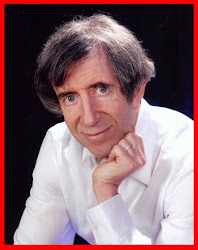 NOTE: Other non-invasive markers of lower risk of sudden death in patients with WPW include: i) Intermittent preexcitation during sinus rhythm; and ii) Abrupt loss of AP conduction (ie, loss of the delta wave) during exercise (which explains one of the benefits of exercise testing of younger patients with WPW). Acknowledgment: My thanks to Massimo Bolognesi, MD (of Cesena, Italy) for allowing me to use this tracing and clinical case. 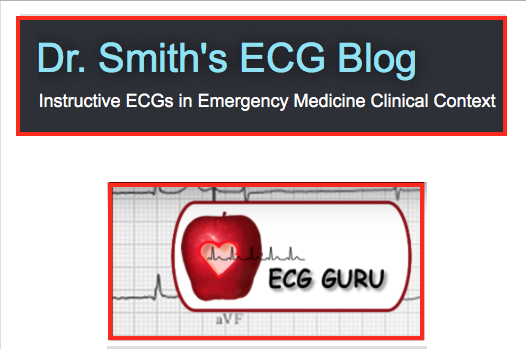 For more on Wandering Pacemaker — Please check out my ECG Blog #65 (Scroll down the page to just above Fig. 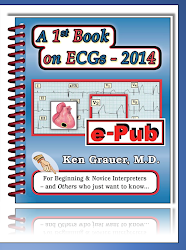 2 for discussion regarding distinction between MAT vs AFib vs Wander Pacer vs multiple PACs). For more on the Concertina Effect — Please check out the brief manuscript by Singla V et al: BMJ Case Rep 2013 (doi:10.1136/bcr-2013-009328).